Event Site is wrapped up for the year, contact us for demo availability at 888-509-4210. Ride. Swap. Compare. Our vast demo fleets of the hottest stand up paddle boards, kiteboards and windsurf boards let you ride to decide. 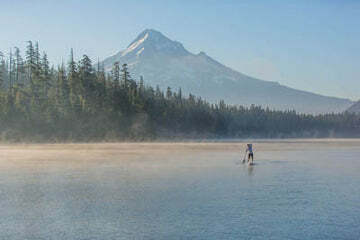 Try them all, right here in Hood River, Oregon, in the Columbia River Gorge. The latest Amundson, Naish, SIC, Starboard, NSP, Hala, and Fanatic boards are ready at the water's edge. Our new Event Site Center is home to 90 boards — including all-round, touring, elite racing and downwind models. All of them sit over a protected lagoon where the water stays flat no matter the wind. Show, go, and switch boards as often as you like. Cost is $20 per hour and up to $100 in demos can be applied to a board's purchase. There's even a Downwind Shuttle to assist with downwind board demos. Click here to sample our fleet! Test ride the freshest wave, free-wave and free-ride boards from JP, Goya, Naish, Fanatic and Starboard. Their latest models are available in most every size, making demos possible across a broad wind range. There's also Goya, Naish, and Duotone sails available for trial runs. It's $40 a day for board demos, $15 a day for sails, and you can swap as often as you want (there's no charge). Up to $100 in demos can apply to a board or sail purchase. Reserve your session here! Sample the latest twin tip and surf lines from Cabrinha, Naish and Duotone, or catch a wave with surf shapes from Firewire and Loyd. Want to foil? We've got LP and the Cabrinha Double Agent. Demos are $35 a day, swaps are encouraged (they're free!) and up to $100 in demos can go toward a board purchase. Don't buy a board with crossed fingers. Sign up for a test spin here!